On March 12, 1977, Fr. 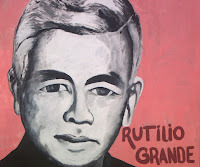 Rutilio Grande, SJ, was assassinated along with two companions as they drove toward evening mass through the fields near El Paisnal, El Salvador. Fr. Grande knew where he was going. During his five years as parish priest in nearby Aguilares, he formed Christian base communities, trained lay “delegates,” and vocally opposed government attempts to silence Salvadoran priests who worked with and organized peasant laborers.